Ways to Grow Your (embroidery) Business - Embroidery For You! It’s amazing how many small businesses fail to take advantage of the Internet’s growth in use for searching. People use the Internet to search for just about anything. This creates a great opportunity for you to grow your apparel business. •	And local searches are soaring because of niche categories, like embroidery and screen printing. Google remains the king of search engines, accounting for nearly 80% of searches. Bing and Yahoo account for about 16% of the searches. There is Importance of top of page ranking: If you’re in spots 2 or 3 for a keyword, e.g., “embroidery”, you can estimate that about 10% of the monthly search volume will visit your website. If you’re in spot 1, about 30% of the search volume will go to your website. Obviously the top spot is where everyone wants to be and it is the best investment you can make in your business. Google’s business model is to get your business listed. They want you to be ranked for the right keywords. If you’re relevant, Google is relevant. Keywords are those words that describe your business. So for “Embroidery For You!” our keywords in very simple words could be screen printing and embroidery, decorated apparel, monogramming, personalization, St. Louis. One of the best free services offered by Google is Google My Business. By registering you list your business with Google and automatically create a Google+ account. And it is easy to use. 1. Make sure your business information is correct. Name. Address. Phone. Business hours. Website URL, etc. 2. Proximity. Google My Business and Google+ allow for more than one location if you have one. 3. Local directory references. Google relies on other online directories, like Yelp, and customer reviews from these directories. The more you have the better. 4. And take the time to put these keywords on the webpage you’re directing people to. Second, use Yelp AND get customer reviews. Yelp has 144 million monthly visitors a month. And people are searching for just about everything, including decorated apparel local businesses. Local Yelp listing is free. Again, make sure your business information is correct. And the most important thing to remember about Yelp (and Google+) is get customer reviews. This will help get you listed high in search results, driving more business. Third, use the other online directories, like YP.com. While the other directories are not as relevant as Google My Business and Yelp, they help with ranking. Nearly all provide a free service and all you need to do is make sure your business information is correct. Embroidery For You! uses Google AdWords. Small businesses HAVE to find time for social media OR hire digital marketer to this for you. 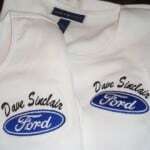 The embroidery and decorate apparel business in St. Louis is very competitive and is actually over saturated. Embroidery For You! posts or markets on several different platforms and thru training and talking to digital marketers, we have learned that we need to post at different times of the day, post different information including pictures, videos, calls to actions, a “did you know” article. A small business needs to grasp the attention of your customers and then hold that attention by offering information in your posts that is interesting enough to make the potential client to keep reading, click to your website, and eventually make a purchase. Once you have the client’s attention, or business, YOU need to keep it by offering quality products and excellent customer service. Visit us at www.embroidery4ustl.com. We’re happy to consult with you over the phone or schedule an in-person meeting.